New York City—8.5 million people living and working within three-hundred-some square miles—the diversity of individuals and endeavors is staggering. 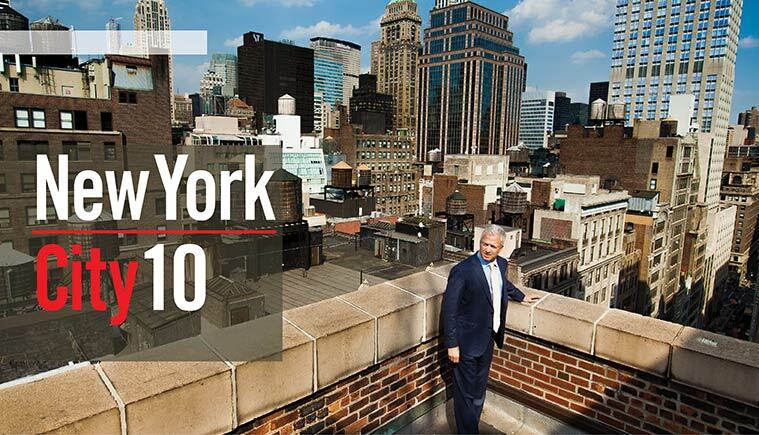 In this issue, we take a look at how ten UVM alumni have made their way in the Big Apple. But this decidedly New York-minute guy finds his balance 1,200 miles away in Omaha, Nebraska. Green, CEO of Alliance, a building cleaning and maintenance company that has thousands of employees and services properties that include Citi Field, home to the New York Mets, leads a dual professional existence of sorts. He is also the owner of two minor league baseball teams—Richmond, Virginia’s Flying Squirrels and Omaha’s Storm Chasers. None other than Warren Buffett offered Green a key tutorial in Midwest 101. The legend of the financial world was among the previous owners of the Omaha Storm Chasers. For the press conference announcing ownership transition, Green asked Buffett if he would introduce him as the new owner of the team, perhaps helping the community accept the out-of-towner. While Green relishes his visits to Omaha during baseball season and the chances to connect with players and fans, he’s also set sail in the Twitterverse (@ChasersOwner) with a following at 36,000 and climbing as a regular way to connect with the community. 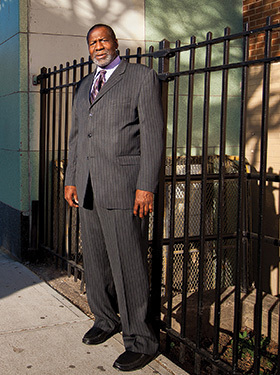 Meanwhile back in New York, Green’s days at his offices on 36th Street between Fifth and Sixth avenues, are a far cry from when he spun the maintenance business out of his family’s SL Green Real Estate, beginning with eight employees and a basement office on Second Avenue. Every job has its day. But hosting back-to-back meetings with Silvio Berlusconi and Vladimir Putin rises to a special level on the challenge index. 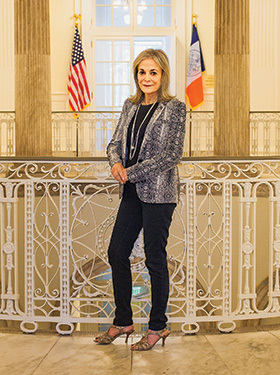 That day, some months in the wake of 9/11, was one of many memorable experiences in Leni Liftin’s two decades working as director of protocol and assistant commissioner in the New York City Mayor’s Office, where she served mayors Rudolph Giuliani and Michael Bloomberg, as well as Bill deBlasio. Those very interesting people included Margaret Thatcher, Mikhail Gorbachev, Benjamin Netanyahu, secretaries general of the United Nations, and many heads of state and foreign ambassadors. The Berlusconi-Putin double header was complicated by the fact that the Italian president was late to his meeting (as was his habit, Liftin adds). Keeping on schedule meant a last-minute helicopter flight to Randall’s Island, where Russian Premier Vladimir Putin would join Mayor Bloomberg and other leaders in a post-9/11 ceremony honoring NYC firefighters. Recalling the terrorist attacks on the towers of the World Trade Center on September 11, 2001, Liftin’s voice fills with emotion. As she stepped out of the downtown subway station not far from City Hall that morning, she saw the towers on fire, heard the sirens, the panic in the streets; she went to her office, where she watched television alone as the towers crumbled and moments later all went black outside her window, then white with dust. While the tragedy of the day struck Liftin on a human level and would add a new level of challenge, and mission, to her professional life, one senses that it also reached her deeply as a Brooklyn native and longtime Manhattan resident. Liftin puts it simply: “I love New York.” And though she is now retired from the Mayor’s Office, she has no plans to leave the city. She’s doing consulting work, and Liftin, an accomplished artist before her career in city government, is also picking up her paint brush again. Finance, theater, fashion—New York City can lay claim to being the global center in a wide array of fields. But “Food Delivery Capital of the World” is likely not a distinction that comes to mind for most. Sanford “Sandy” Plotkin would be an exception. “New York is where people order food any time of day or night. Whether it’s sushi or pizza, this is where the business is,” Plotkin says. And there’s a very good chance that New Yorkers, and millions of more people throughout the United States and worldwide, find their food piping hot on arrival thanks to Sandy Plotkin and his team of employees at CarryHot USA, the world’s top manufacturer of insulated food delivery bags, headquartered in Manhattan on West 33rd. CarryHot’s success story begins, you might guess, with a cold pizza. 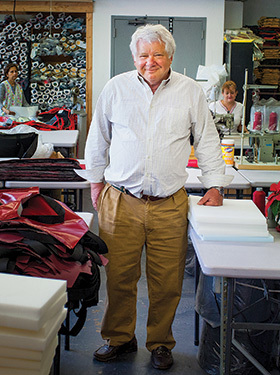 But first some background: Sandy Plotkin’s father founded Avon Belt and Trimming Co. in 1932. They manufactured parachute straps for the military during World War II, and later grew and morphed into the world’s third leading belt manufacturer with licenses such as Christian Dior. Avon was a highly successful enterprise. But that changed—slowly, then quickly—as the garment business moved to where the labor was cheapest. As he tells it, Plotkin was at home, depressed about his dwindling business, pondering what was next. He ordered a pizza that was delivered fatefully cold. The Aha Moment. 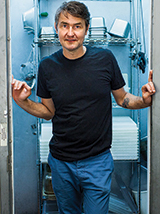 Plotkin realized he had the factory floor, the equipment, and the skilled workers to build a better way to keep a pizza hot. 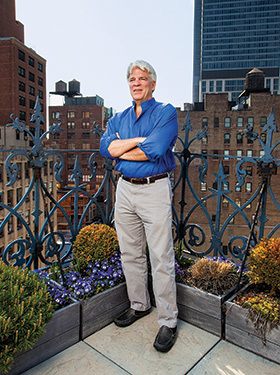 But New York is in Plotkin’s soul—“there’s really nothing about New York that I don’t love,” he says— and he would return there after graduation, working for more than a decade in the corporate world at Pfizer before joining the family business. Retirement? “Sure. When my keys fall out of my pocket, and they carry me out. That will be the end,” Plotkin says. Brooklyn and Hudson Valley. Artist and restaurateur. The duality of alumni couple Megan Lipke and Paris Smeraldo’s life and work together is never quite so simply expressed as those days that Megan loads their car with fresh organic produce they’ve grown at their home garden in Ghent, New York, slides her recent paintings on top, and heads south for the two-hour drive to Brooklyn’s Bushwick neighborhood, home to their restaurant, Northeast Kingdom, and Lipke’s studio space in the city. In 2005, the couple leapt into the New York City restaurant business in unlikely Bushwick, defined at the time by drug dealers and open prostitution on the street, Smeraldo recalls. A bouncer at the door was necessary to keep things secure. With a family background in the restaurant business, Paris says “that has always been what I wanted to do without really knowing what I wanted to do.” For a pair of native Vermonters (Megan is the daughter of longtime art history prof Bill Lipke), the origins of the Northeast Kingdom name seem plain. There is that, Smeraldo says, both of them love that remote, ragged corner of the state. But there’s also a deeply buried double entendre—Bushwick is in the northeast corner of King County. But most importantly is what Northeast Kingdom suggests of the vibe they hoped to create in their restaurant on an urban frontier. “We were enamored of this idea of stumbling across something, a warm cabin, a hunting cabin, a refuge where you’re not expecting to find it,” Smeraldo says. Despite the odds, Northeast Kingdom found quick success in Brooklyn with a contemporary American menu emphasizing “the seasonality of the northeast.” A lot has changed since the early days when Smeraldo was in the kitchen and Lipke ran the front of the house. They now have a chef and a manager and keep things running with trips to the city. Smeraldo’s focus remains on the restaurant, Lipke on her art, and both juggle life with their three young children. Things have also changed for Bushwick, now a more likely neighborhood for their restaurant and a friendly place for artists. Megan’s studio is just two blocks from the restaurant, making it easier for her to do those produce drops then show her work to dealers. With her work in more than twenty shows last year, things are thriving on that front, as well. Manhattan native Jarrett Lilien’s career in finance has included years living in some of the world’s great cities—London, Hong Kong, and Tokyo. But he says he probably didn’t fully appreciate his own “hometown” until he returned there to live in 1996. But before he gets to what he loves about NYC, Lilien comes clean about what he doesn’t love: “Sometimes I walk down the street, shake my head, and I’m thinking, ‘Oh, my god. This city.” He rattles off the frustrations—noise, dirt, traffic, and, let’s say, many New Yorkers’ forthright nature. Joining with friends (including fellow UVM alumni John Lord and Scott Chace), Lilien launched TIR Securities, a global institutional broker. They would grow to execute trades in fifty-five global markets, join sixteen global exchanges, and set up businesses in multiple countries. A global citizen by that point, Lilien went where his enterprises needed him most. Plans to build their U.S. market would bring Lilien back to New York in 1996, and another transition followed not long after when E-Trade bought TIR Securites in 1999. Across the next decade, Lilien would hold CEO and COO roles at E-Trade before leaving in 2008. He now leads his own financial services venture, Bendigo Partners. Lilien’s days are split between work and family and finding time to workout, sometimes with a trip to the boxing gym. Volunteer leadership on arts boards, such as WFUV Radio and the Baryshnikov Arts Center, is also another focus these days. Listing those pleasures of New York City Life, Lilien counts access to the best in the arts, particularly music. As president of the Jazz Foundation of America, he champions support for aging musicians in difficult financial circumstances. Lilien led efforts to create a concert at Harlem’s Apollo Theater featuring musicians aided by the foundation, a fundraising effort that has greatly increased the organization’s capacity. Father and daughter, Bernard Palmer ’75 and Sydney Palmer ’14 came to know very different cities during their undergraduate years in Burlington. Sydney knew the Burlington that is the darling of media best lists for everything from tech innovation to the arts to craft brews to outdoor recreation. Bernard knew a sleepier place. For a guy who grew up in Harlem, calling it a “city” then would have been a stretch. “Those were the days when you could still drive up Church Street,” Palmer says with a laugh. Recruited to play basketball for the Catamounts, Palmer recalls his desire to experience a different environment made him choose Vermont for his college education. While Burlington may have been a little somnolent, he found a solid education in business and made friendships among his basketball teammates that endure to this day. Beyond endorsing his alma mater for his younger daughter’s college years, Palmer has long been a stalwart UVM Alumni Association volunteer and advocate for the university. “I just like helping out and seeing the school thrive. UVM is a gem in the rough. I just try to point people in the right direction because it did a lot for me,” Palmer says. Aside from his UVM experience and time earning his MBA at the University of Cincinnati, this son of the city has spent his whole life in New York, New York. For the past ten years, Palmer has served as a top human resources administrator in the New York Public Schools. His job involves HR oversight of thirty-two high schools scattered through every borough but Staten Island. Before the NYC schools job, Palmer built a twenty-year career in HR at Time Inc., his job among those lost after the 2000 merger with AOL. Asked about the shift from a media industry to education, from a private business to a public enterprise, Palmer says the fundamental ethic that drives his work remains the same. It was the scariest thing I’ve ever done. And, to be honest, I don’t know if I would even do that again—to move to New York with nothing but a few bags of clothes,” Emma Grady says, recalling the leap to live her dream. Grady’s professional focus as a fashion writer and ethical style expert didn’t lack for audacity either. Straight out of UVM, she built her credentials writing on eco-focused topics through an internship in Newport, Rhode Island, with the editor-in-chief of treehugger.com and Planet Green. Grady’s interest in fashion traces back to childhood watching old Hollywood movies with her father. She was deeply drawn to the classic styles. 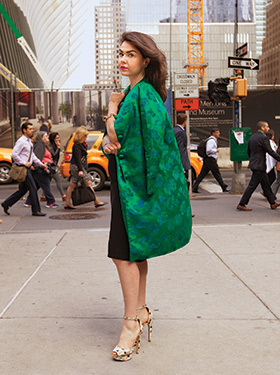 Her passions connected when Grady convinced her editor to assign her coverage of New York’s Fashion Week from an eco-conscious angle. Emmagrady.com gives a sense of the diversity of the young alumna’s endeavors. She co-founded the Ethical Writers Coalition, edits Past Fashion Future, an internationally acclaimed website she founded, and has juggled it all with jobs to help pay the rent. On that front, Grady just took a big step by landing work as a contributing video associate at Vanity Fair magazine. “Ethical fashion expert” begs some definition, and Grady obliges. 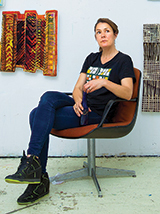 She considers everything from human rights issues for garment workers to the eco-friendliness of cotton production to businesses that build socially conscious practices into their brand identity. Grady notes that beautiful design and style are always critical—classic and timeless are her watchwords. Given that, it’s not surprising that Grady is a big fan of vintage clothing, enjoying the thrill of the hunt, the individuality, and an ethic found in well-crafted clothes worthy of being mended rather than tossed. Looking back on his nearly twenty-year career as a prosecutor and attorney in public interest roles, David Szuchman considers his most challenging work. It doesn’t take him long to describe a 2004 case while he was working with the Department of Justice focused on child exploitation and obscenity crimes. The United States V. Mariscal involved the prosecution of a man who created and sold videos of child sexual abuse. HIV-positive, Angel Rafael Mariscal traveled to countries such as Ecuador and Cuba where he found children to exploit, participating in and filming the sexual acts himself. “On a case like that, you leave for work every day feeling like you’re wearing a white hat,” Szuchman says. Negotiating hurdles such as securing cooperation from the Cuban government, Szuchman and his colleagues earned a guilty verdict and a sentence of approximately one hundred years. “There’s just a feeling of complete redemption for the work you’ve done,” he says. Szuchman, now executive assistant district attorney and chief of the investigation division in the New York County District Attorney’s Office, found his interest in public interest law emerging during his UVM years. He studied political science and took leadership roles with the College Democrats on campus during presidential campaign years that saw President Clinton and Vice President Gore both visit Burlington. 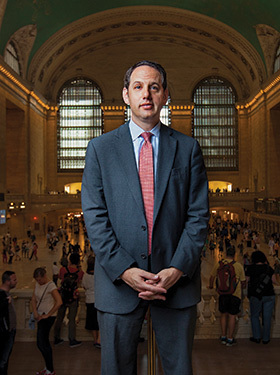 Straight out of Hofstra Law School, Szuchman landed his dream job with the Manhattan District Attorney’s Office. “I knew graduating from law school that would be an amazing experience and opportunity to do good,” he says. Szuchman’s career has also included directing the State of New Jersey’s Division of Consumer Affairs and leadership roles in the district attorney’s office on cybercrime and identity theft. New York has always been in Szuchman’s blood. He grew up just outside the city, and he and his family live in nearby Westchester County now. He commutes to work in the complex of buildings around City Hall in Lower Manhattan. Let’s begin David Sweeny’s story far from New York City, but in a likely place, 300 miles north in Burlington, Vermont, where the alumnus has returned on a March Friday to talk with UVM undergraduates. Sweeny, a Brooklyn-based industrial redeveloper who heads up his own PDS Development Corporation, has a central message he wants to share, particularly with the seniors who will soon be leaving college’s dewy meadow behind for what might seem a very scary professional world. That said, Sweeny was one of those grads that makes his yet-to-be-hired friends cringe a bit. Graduate on Saturday, move on Sunday, start work on Monday. Sweeny, who is blind, had begun to lose his sight to ocular cancer not long after graduation. But he recalls that in the spring of 1987 he still had the vision to search for a job the old-fashioned way—circle every help wanted ad that seemed remotely possible in the New York Times classifieds and send out a blitz of cover letters and resumes. That first job was with the non-profit North Brooklyn Development Association. A summer internship on Wall Street had shown the economics major that a more traditional path in the financial world wasn’t a good fit for him. 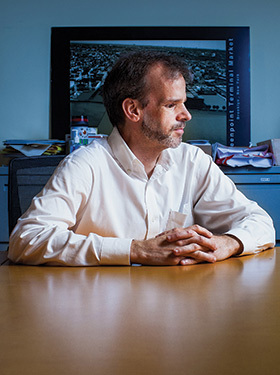 In Brooklyn’s Greenpoint neighborhood, Sweeny led a project that would help shift the data. “I became very interested in how do you retain competitive business in an urban setting, then very interested in how you promote the formation and early growth of small businesses,” Sweeny says. In Greenpoint, the answer was the renovation of five neglected industrial spaces, creating incubator space for as many as 130 fledgling businesses. PDS Development continues to work in a similar vein, buying vacant industrial buildings in Brooklyn and Queens, renovating and leasing them.